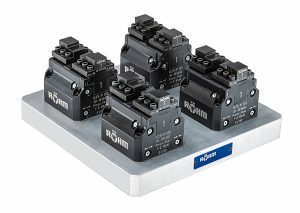 The upgraded KZS centric-clamping vices from Röhm are suitable for, among other things, six-sided machining involving two clamping operations on round or prismatic workpieces. KZS range vices deliver clamping forces of up to 55 kN, an increased clamping range of 20% and a reduced interfering contour for optimal chip flow. 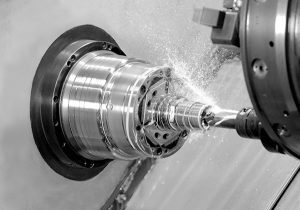 For use in three-axis, four-axis and five-axis machining centres, as well as all the usual zero-point clamping systems, both of the products in the range can be operated either pneumatically or hydraulically. In particular, this fact also means they are suited to scenarios involving robot-assisted workpiece loading. Here, the cost-saving opportunities are large. For example, one or two KZS clamping blocks can replace a large number of manual vices in automated procedures. KZS vices can be loaded directly into the machine by a robotic arm. 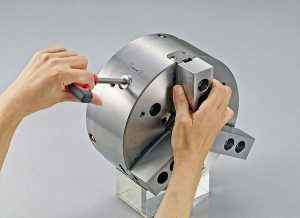 This potential means that it is not necessary for an operator to pre-position the workpiece outside the machine with an extra clamping device. Furthermore, a separate manual vice needs not be available for each component. When combined with a zero-point clamping system, such an arrangement makes it possible to shorten cost-intensive set-up times. Röhm can even adapt its centric-clamping vices to other manufacturers’ zero-point clamping systems. The direct benefits for the user are shorter set-up times, better utilisation of machine times and higher productivity levels. With KZS vices, the precision wedge hook system is said to result in superior part quality and a high level of process reliability. Furthermore, an improved lubrication solution ensures that the clamping forces always remain at their highest level. Consequently, the clamping blocks are also suited to sophisticated milling operations associated with high material removal rates, high cycle numbers and tight machining tolerances. MASA’s range of Microconic work-holding systems for the sub-spindle clamping of small workpieces in sliding-head lathes such as those manufactured by Tornos, Citizen and Star, is now extended following product launches at the recent IMTS (Chicago) and AMB (Stuttgart) exhibitions. Previously, the system was only available for F20 and F25 style collets. 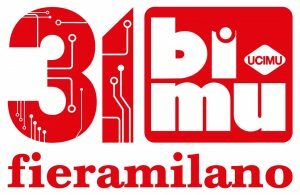 However, MASA has extended this line-up to add the F37 (1536E) cartridge for 32 mm diameter capacity machine tools, as well as the F20-201 (136E) system that is specific to Tornos machines. Availability in the UK is via Floyd Automatic Tooling. Microconic work-holding systems consist of a cartridge and precision collet. 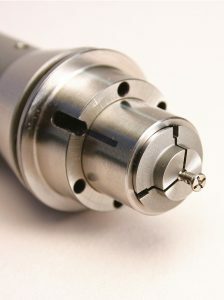 The collet fits inside the cartridge and is adjusted before being fitted directly into the existing collet sleeve. No machine adaptations are required. Featuring clamping diameters from 0.2 to 10 mm, the collets offer a concentricity level of 3 to 5 µm. The cartridge system incorporates a solid extended nose that is said to be rigid and robust. Of note, the device has the facility for micron-adjustment of the collet closure, ensuring that even the most fragile of components can be clamped. These hardened and ground cartridges can also be used as gauges to verify machine spindle accuracy. The cartridge/collet combination can accommodate openings beyond 4 mm larger than the clamping diameter (depending on the application). This flexibility gives the production engineer the possibility to machine the part the other way around, which can often improve cycle times. Microconic collets are available in 0.05 mm increments, from 0.22 up to 10 mm diameter. Each collet has a nominal clamping range from 0.05 to 0.1 mm, depending upon the chosen collet diameter. 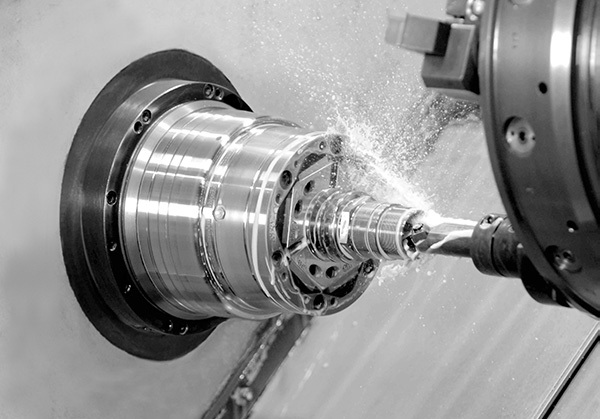 1st Machine Tool Accessories is advising that a quick-change chuck has the ability to eliminate a majority of the time wasted when changing jaws on a conventional chuck, decreasing the delay between the end of op 1 and the beginning of op 2 by as much as 90%. Instead of wasting 20 minutes, changeover typically takes just two minutes. The company has produced a cost calculation based on the use of a Kitagawa QJR (Quick Jaw Release) chuck, in support of its claims. The cost comparison generated by 1st MTA, which shows ROI in a very short time, is based on the use of a Kitagawa QJR chuck. Available in four sizes (7, 8, 10 and 12”), QJR chucks use the same jaws as standard chucks in the range. 1st MTA’s hypothetical illustration is based on the use of a QJR10, a 254 mm quick change, three-jaw, large through-hole power chuck with five sets of standard metric quick-change jaws plus soft jaws, which all costs £6124. 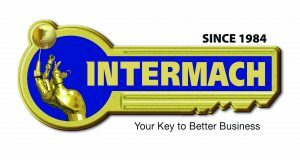 This chuck interchanges directly with a Kitagawa BB 210 large bore chuck, priced at £2177 with five sets of jaws, with which the comparison is made. The average time saved when exchanging the QJR chuck instead of the BB chuck is 15 minutes. Based on three set-ups per day and an estimated machining cost of £60 per hour, the daily cost saving for the three changeovers is £45. The difference in purchase price between the two chucks is £3947. At £45 saving per day, the time required to break even is slightly less than 88 days. On this basis, the total saving by the end of the first year is £12,478, after which the annual saving is £16,425. Working in the high-speed, high-pressure, environment of motorsport, West Sussex-based Nova Racing Transmissions is constantly working to tight deadlines. With customers ranging from teams in the World and British Superbike championships, down to club-level racers, producing parts on-time is vital. For this reason, the company has turned to tooling partner Ceratizit UK & Ireland and its WNT brand to deliver improved performance across its machining activities, particularly in the manufacture of gear selector forks. 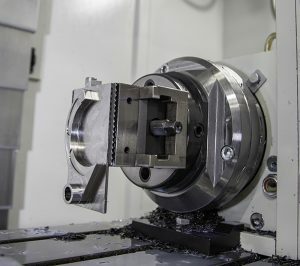 The most recent development was the introduction of WNT’s ZSG4 centric vices, along with its MNG zero-point location system (pictured), which is used on the bed of the company’s new XYZ 710 VMC HD and on the 4th-axis unit on the machine. As a result, an on-machine flowline has been created that delivers one complete selector fork every cycle from a raw billet. This new process delivers both time savings, with set-up times halved, as well as improved quality and consistency. Nova Racing Transmissions’ partnership with Ceratizit is a two-way street, with Nova supplying gearboxes and gear ratios to Sam Burman and her WNT Burman Racing MOTO 3 GP team, which she races in the British Motostar Championship. 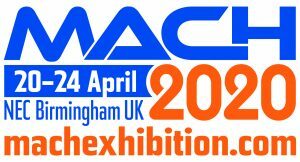 At last month’s Southern Manufacturing 2019 exhibition in Farnborough, Hainbuch presented a range of chuck solutions. With flexibility, minimal interference contour and precision levels all being key factors for modern work-holding solutions, Hainbuch demonstrated these attributes in its newly developed range of TOPlus (pictured) and SpannTop mini chucks. Of particular emphasis was the latest SpannTop modular mini chuck. Hainbuch has developed the chuck to make it compatible with an adapter ring in order to leverage the benefits of the modular system. The company‘s Mando Adapt mandrel and the corresponding jaw module already work with the SpannTop mini, meaning complete autonomy for small component clamping needs. Unlike the SpannTop mini chuck, the configuration of TOPlus is a little different. Whereas SpannTop uses an adaptor ring, TOPlus has a ring of attachment holes to secure the jaw module. At Southern Manufacturing, Hainbuch demonstrated Mando Adapt adapters, which also work in harmony with TOPlus, while additional innovations included the Manok and Hydrok hydraulically actuated stationary chucks. Depending on size, the Hydrok can be used with all clamping device adaptations, such as the Mando Adapt mandrel-in-clamping device, or with the jaw module. The Hydrok incorporates typical Hainbuch features such as user-friendly set-up, parallel clamping, optimal power conversion, rigidity and high holding power. With a repeatability of less than 0.01 mm possible, the Hydrok is suitable for five-sided machining as well as flexible clamping scenarios such as mandrel clamping or jaw clamping thanks to the Hainbuch modular system. Another key innovation at the show was the new TestIT clamping force gauge system that has been developed in conjunction with Siemens.